"The rooms are quite clean and bed are very comfortable." Have a question for Movenpick Hotel Sukhumvit 15 Bangkok? 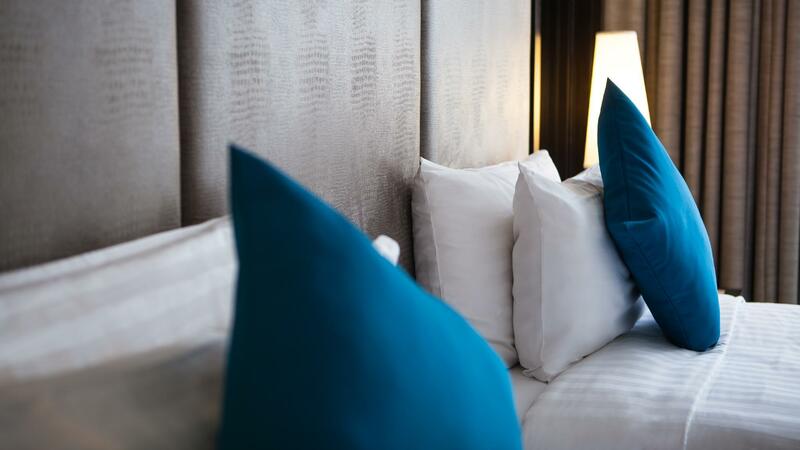 "Clean, good food, well located, et so much more..."
Movenpick Hotel Sukhumvit 15 Bangkok enjoys a central location with easy access to all of Bangkok’s shopping, business, and tourism landmarks. Terminal 21 Shopping Center, Queen Sirikit National Convention Centre, and the world famous MBK and Chatuchak Weekend Market are just short BTS rides away. 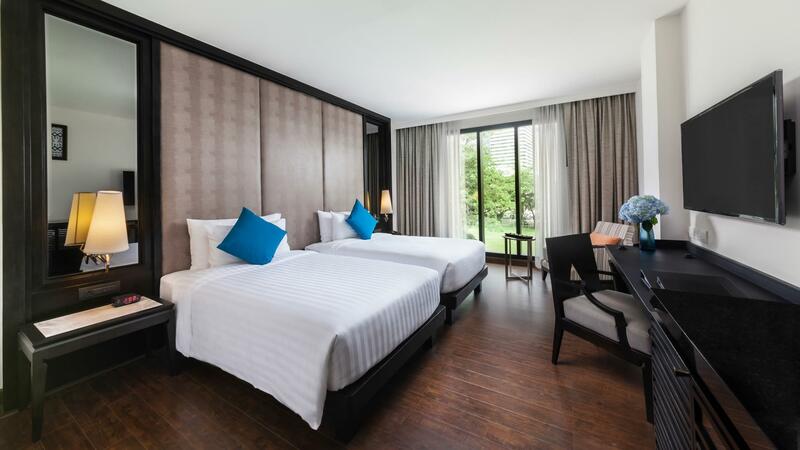 Guests can easily walk or take a complimentary tuk-tuk ride to the BTS Asoke Skytrain Station, MRT Sukhumvit Subway Station, and Terminal 21 Shopping Center. 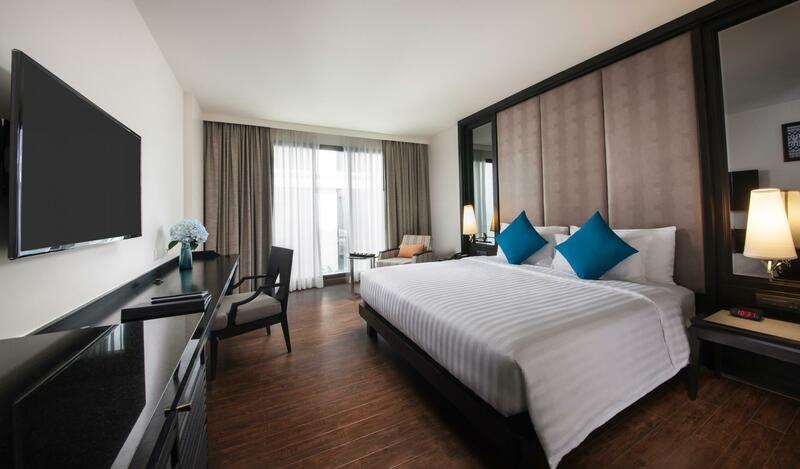 Movenpick Hotel Sukhumvit 15 Bangkok offers impeccable service and all the essential amenities to invigorate travelers. The hotel provides free Wi-Fi in all rooms, 24-hour security, daily housekeeping, and passionate service to ensure guests the greatest comfort. All guest accommodations feature thoughtful amenities to ensure an unparalleled sense of comfort. The hotel's fitness center, outdoor pool, and garden are ideal places to relax and unwind after a busy day. Discover an engaging blend of professional service and a wide array of features at Movenpick Hotel Sukhumvit 15 Bangkok. 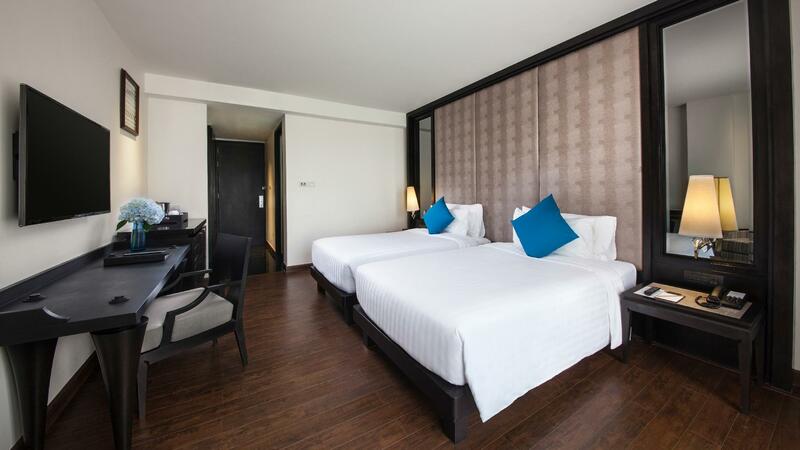 "Good hotel and best location"
Very close to Terminal 21/Asoke station (10 min walk). Room nicely decorated, bathroom clean & well equipped, staff quite helpful. Bed was comfy. I added executive lounge option which I think was well worth it. It came with free happy hour drinks & snacks, free breakfast (w/ great variety and delicious BTW), and even free laundry (2 pc/day)! The gym and rooftop swimming pool were both adequate but on the small side (I didn't use either though). Had a wonderful stay and would recommend it. Unfortunately, I cannot recommend the stay. In the morning prior to checkout I was doing some work in my room when I started to feel a very strong smell of chemicals coming from A/C. The smell was very unberable which caused me to initially open the window (noise from nearby construction side) amd eventually check out earlier. The staff at the reception did not seem to care much about the situation reported and was more interested in minibar consumption. When I repeated my request to speak to someone about the situation and asked if anyone else reported the problem they simply said yes and thank you. I stayed in the reception for another 15 min waiting for my taxi however nobody has approached me to discuss the situation. One of the room checked in with defects. Bad experience on the showers. Request for room change but without status update. Until I called reception then told me there was no room and can only changed room after 2pm the following day. Breakfast selection is poor for a 5stars property! Turn up in the hotel 230pm but was waited 30 minutes due to room not available . Told the staff i ll be returning in couple of hours and give them ample of time for room preparation. When i check in again 5pm there is still no room for me . Room key is not ready . Staff was finding room in front of me . This is totally unacceptable ! This was my second time staying at the Movenpick in Bangkok. Rooms are ok, and clean. Location is perfect and the value for money is outstanding. Would highly recommend to friends staying in Bangkok. This is a newly built hotel with good facilities and excellent service from their staffs. Tuk-tuk services to nearby shopping malls are provided, complimentary from the hotel. The room is clean and spacious and the beds are comfortable. The breakfast is good with a variety of continental selections. It is location very conveniently in the city centre areas with ease of a BTS train station very nearby the hotel and hence accessibility is very good from & back to the hotel. Furthermore, their staffs are friendly & helpful, and they are able to communicate in English & some other languages. Their services provided is very good and you will really appreciate their warmth in delivering good customer experiences to their customers. Great 5* experience. Hotel is very nice. Staff courteous and v helpful. Amazing breakfast buffet with Mövenpick ice creams. Rooftop pool and bar offers great way to relax in this bustling city. Definitely recommend. The staff were extremely friendly and professional it really put us at ease with our 4 year old . We stayed on the executive suite and we found this very enjoyable, relaxing and special . We also enjoyed the rooftop pool and bar area where again the staff were exceptional. We travel to Thailand a lot and stay in many different hotels , Movenpick has really stood out and we will definitely return in the future. Terrible service. Booked 2 rooms. Got 1st one at 2pm, second one only after repeated followups after 2.5hours. Only to find acs didn’t work. Finally after followups again, given a room on a separate floor, far away from rest of family, only to find the bathrooms stank of the sewers. Had a good an memorable stay in Movenpick. Even as we checked in the hotel until when we checked out, the staff were really hospital. Would like to thank Ying, the manager of the restaurant for being very helpful and friendly, thus making our stay a memorable one. The room was spacious and clean. Especially love the powerful shower. The breakfast s array of food was great. There is a frequent complimentary tuktuk shuttle to bring us to Terminal 1, Robinson and BTS which is quite nearby. Hotel itself was beautiful and upscale. Great location walking distance to mall and BTS plus free tuktuk every 15 minutes. I didn’t love the room. The bathroom was nice but the room was small and dated to me. Bed firm as per usual in Asia. We enjoyed our stay at Movenpick. The waiter during breakfast, Dennis, was so attentive, attending and giving in to all our requests. The phone operator , China, was fast in attending to our phone requests, especially the extra bottled water. Hopefully, all staff are like those two. Definitely, will book with them again. 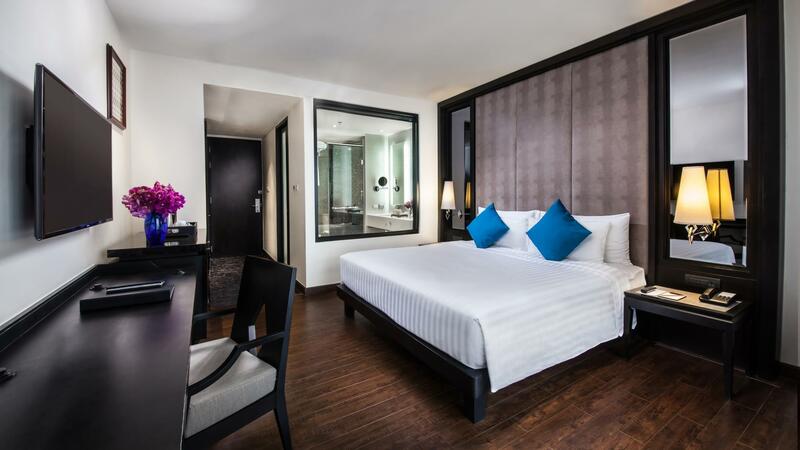 We decided to spend New Year in Bangkok and booked at the Movenpick Hotel Sukhumvit. We were not disappointed. Good breakfast food selection; there was a waiter named Dennis who was very attentive, friendly, always giving in to our requests, just great guy who was always smiling and nice. He stood out from the rest of the staff as his service was exceptional. Then, the phone operator, a girl named China, has a similar attitude. We requested for additional bottled water each time for our room, and one initial request, we got it for the rest if our stay. Very attentive, professional, friendly, never missed a beat. But of course, there are cons. First, I asked the front desk girl to break 1000 baht for me to pay for Grab. Instead of finding ways of giving in to my request, she readily said she did not have the change and suggested that I go to the nearby 7-11 to have my money changed. Great service! Then, we were being charged for a resto order that we did not consume. No! very modern and stylish hotel. there are three buildings. the third one which was where we stayed in required a short walk part of which was unsheltered. to use facilities located in the second building you had to come down to ground floor walk across and go back up which was troublesome. request for a room in building 1 or 2 if possible. tuktuk service was prompt and good. Landscaping deco and furnishing made hotel very posh and relaxing. Breakfast great! Staff service great! Stay king club lounge room. Clean. Bathroom was well layout. Room was small. If there was some space for 2 chairs n a table would be good for food n drinks and simply for sitting and chatting. But guess it is fine as i had the club lounge to rest at. First time choose Movenpick, it give me a very good experience as a tourist. Very helpful staffs and always welcome to help you. A bit far from the Main Street, walk need 15 mins from Main Street but free tuk tuk service is on every 15 mins interval to Terminal 21 & Asoke MRT station so still consider very convenient on such busy city location. I will choose to stay again for my next Bangkok visit.